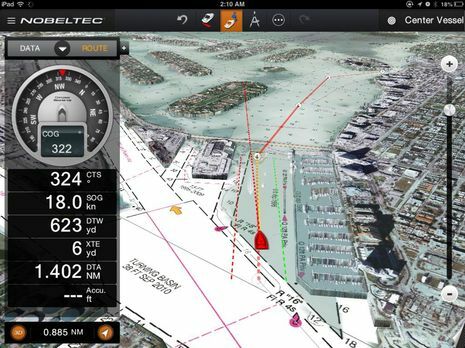 Nobeltec TimeZero, “most advanced marine navigation App for iPad on the market”? I haven’t actually cruised with the TimeZero app yet but I was able to preview it before it made the iTunes store last week and, as the top screen indicates, I have already seen its excellent (Bad Elf Pro powered) tracking while underway in car and dinghy. 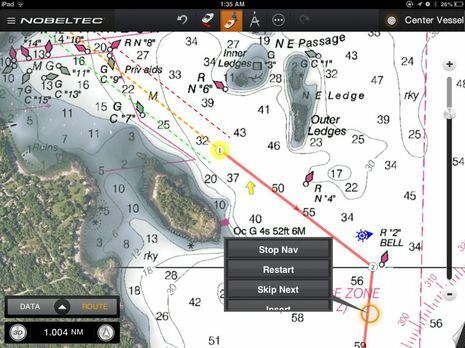 The “most advanced marine navigation App for iPad on the market” claim is quite bold, and I always tend to think that such judgments are quite subjective, but TZ is remarkably able and polished right out of the gate. And while there are lots of valuable charting features it doesn’t support — more on that further down the entry — I’m not sure there’s another app that does core navigation so beautifully. When I recently raved about Furuno TZT chart plotting I had no idea that so much of the experience could be transferred to an iPad. But the same MaxSea developers who seem to be behind all the TZ products (including their own version of the TZ app eventually) certainly pulled it off. It’s not just that some of the same MapMedia charts along with PhotoFusion sat images blend, zoom, pan, and go 3D in the same smooth manner, though that’s huge. 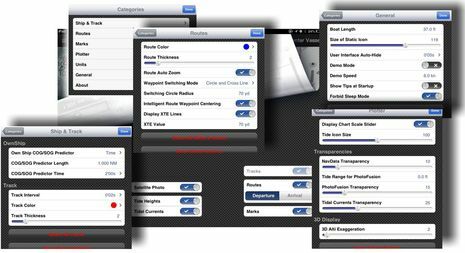 The app developers also manages to include much of the plotter control and route-making sophistication you’ll see on the high-end TZ displays and PC programs, and make them very easy to use on an iPad. I sometime get frustrated with many charting apps because they’re missing some route functions and/or the functions are hard to manage with a finger tip. Touchscreen object picking is tricky business and I’m probably more demanding than most because I’m currently using an iPad mini and Dupuytren’s contracture has some my fingers pretty crooked up (in fact, I’m going in for more surgery later today and may not be typing well for a while). But picking routes, waypoints, and marks on the TZ screen always seems easy and I always seem to find whatever option I might need. There’s also a route management feature I’ve never seen before but just love. Instead of having a route list that may be indecipherable unless you’ve taken the time to name the routes (if possible), they collapse when not in use into that blue ship wheel icon seen on the screen above, just north of R “2”. If I stopped using the activated route on that screen it too would shrink into a similar icon at the starting waypoint and clicking on either would expand it. You can choose whether the dormant route icons live at the first or last waypoint. So slick! The TZ app is free but the North American, Western European, and Mediterranean charts you can buy within are not (region maps here, prices $40 to $50). Once you’ve bought access, though, managing chart downloads and iPad space is dead simple, even elegant. What I’m not sure of is the quality of photo maps outside the U.S. and also how deeply they are cached for use when your device is offline. I did some experimenting and the photo maps I’d looked at while planning and armchair cruising were definitely there when I shut the WiFi off , but I’d like to know more about how that works. The screen above shows many of the advanced tweaks a TZ user can apply by either “peeling” back the chart page or dipping into the menu categories. I like having those controls, but don’t be alarmed; the app is quite easy to use without any tweaking. 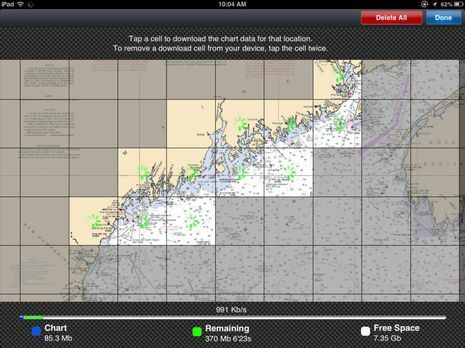 On the other hand, there are many current chart app features you won’t see on that screen, like support of cruising or fishing info (ActiveCaptain, Navionics UGC, etc) or NMEA input of data like wind, depth, and AIS (which is getting quite easy in numerous apps thanks to Navico GoFree and other WiFi intermediaries). I don’t think there’s even a way to share routes or tracks with friendly humans or machines, which seems especially sad as TZ is so good at making them. Then again, it is version #1! But don’t take my word for any of this. If you have an iPad2 or better (i.e. one running IOS 6) the free app comes with charts of Miami and a demo mode that lets you make and follow routes. Try it! I’m especially hoping that other charting app developers will check it out 😉 Plus those who are skeptical about 3D chart plotting but haven’t gotten even a demo sense of what it’s like underway. Just tap that little 3D button or, better yet, try two finger vertical swipes, just like a Furuno TZT. Please don’t blame me, though, if you end up buying a chart region, a TZ computer program, or maybe even a big hunk of hardware. Next story Fusion Marine Stereo 2013, great but confusing! Previous story Vesper Marine WatchMate, still the leader in AIS collision avoidance? Hope you recover quickly from your operation! Got any ancestors from Scandinavia? Your link to their charts only show NOAA raster charts…are they offering any vector charts, or plan to? I downloaded the application from the App Store and purchased the Great Lakes Canadian charts for $50 because they appear to cover both US and Canadian waters; the US charts did not appear to cover Canadian waters. I then followed the instructions and downloaded the chart cells for Lakes Ontario and Erie. However, the detailed charts in the cells will not display. I contacted Nobeltec support by phone and spoke to a tech that had no knowledge of the app or how it works on the iPad. He asked me to send him a screen shot and then advised me he would send the screen shot to the cartographer. I asked if I could speak to an expert on the iPad app but, no one was available (they did offer to have someone call me). I would hold downloading or purchasing any of the chart kits until Nobeltec gets the wrinkles ironed out…probably version 2.x. The current version is not ready for practical use, let along commercial sales. Were these, in fact, raster charts? Frankly, I’m only interested in Lake Champlain coverage, including NY, VT, and Canadian portions. I’m currently using OpenCPN, but hate the raster charts with everything sideways or upside down in course-up mode. 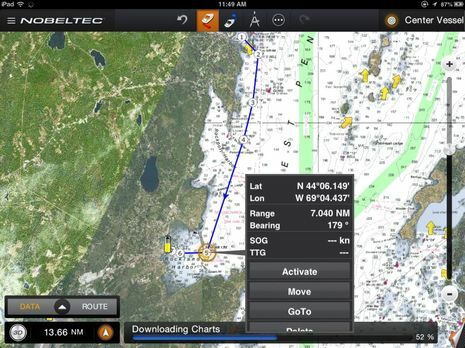 I’m still thinking of buying the Navionics app, although I’ve never even seen it displayed…I know it is only equivalent to their Gold charts,if even that, but wish they offered a Platinum option with 1′ depth contours for that lake. But, they probably don’t want to give away the store and compete with their Platinum + chips intended for several brands of MFDs. They only offer raster charts. I have a Raymarine E120 with the Navionics charts on it. I tried the Navionics iPad app and the Garmin iPad app on a recent trip from Superior, WI across Lakes Superior and Huron to Georgian Bay and finally Lake Simcoe. I like both applications a lot. I wish the Navionics app had a course-up view (couldn’t find one) and I wish the Garmin app had a course leader-line like the Navionics app. Both apps offer their own vector cartography that is detailed and complete. I’m disappointed that Nobeltec only offers raster charts. I’ve used their VNS app on my laptop in the past and enjoyed their excellent cartography. Charging for raster charts is a bit outrageous, at lease for US charts, since they are free from NOAA. Certainly looks good, but why no western river charts? Karl, after downloading the app and looking at the installable charts, I can confirm they are all rasters at the moment (and cover only the US, Europe, and the Med). They’re hard to read even when north-up — the sample chart of Miami is in fact not oriented NUP for some reason — and are useless in 3D. I hope Nobeltec makes the ENCs available soon as the app looks decent otherwise, with routing that is, while still frustratingly clunky, still easier and more flexible than the other iPad options I’ve tried. I’m apparently missing something obvious…since you’re so enthusiastic about it…do you get a free vacation from them, or some visits from some nice, friendly young ladies? Either of which would tempt me, too, especially the latter…otherwise I’m confused in why you’re promoting it at this point in its development phase. Please check this Swedish navigation App for Ipad and soon Windows 8. Advanced and yet simple to use with chart subscription. Karl, I wrote what I wrote because I believe what I wrote. If you look through Panbo you’ll see that I use raster NOAA charts a lot, including head-up and 3D. Fine for you to not like them but please don’t tell me what I should find useful for navigation. I’ve been doing it a very long time. Also please don’t question my integrity. I think it’s obvious but Nobeltec TimeZero is a premium nav tool at a premium price. You pay for the whole package when you buy the charts. I think it’s nice that the app part is free so people can really try it before buying it. I wonder why Karl is questioning Ben’s motives for being enthused by this helpful, easy and very inexpensive app? Is it the $40.? You can’t buy a used chart book for that price. You can barely get a meal at a marina for $40.00. I’m a Yankee and pinch pennies, but thinking the price for a full set of charts and good app is high at $40. is penny-wise and pound foolish. If it keeps you off the rocks its money well spent. I’m enjoying playing with this app and look forward to using it afloat along with my very expensive paper charts and chart-plotter. So far it seems simple and clear enough that even I can figure it out. Thanks, Ben for pointing out this app. I have been playing with this app for the past day, and have to say I’m really impressed with the user interface. It certainly isn’t the workhorse of an app like iNavX, but it packs a lot of interesting features into a very clean, intuitive user experience. Nobeltec seems to have designed this for a very clearly defined niche market of weekend or avocational boater. It puts significant power into a package that doesn’t require a huge user commitment to learn. Once you’ve learned it, you won’t need to be going back to the user guide. 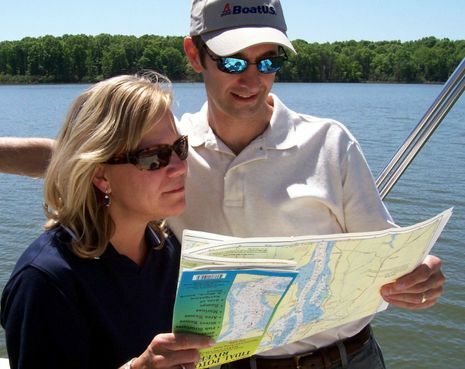 Gone are the long lists of waypoints and routes– why you can barely even find the word “waypoint” in their user guide. The collapsing-expanding route icons are very clever and make it dead simple to move from one route to another without having to shuffle off to other screens. With a quick review of the user guide you find that the tide & current icons and the weather window pack a fair bit more info than is first apparent. And I for one am happy to finally see an app with current vectors overlaid on the chart, even understanding the real-world limits of current data and prediction. In some ways, the way Nobeltec has rethought the organization and implementation of nav data for a touch interface is a real game changer. Like Ben said, I hope other developers take a long look at what they’ve done. It is definitely not an app without its limitations, but I think part of the real genius of this app is what they’ve chosen not to put in it. Nobeltec’s is not trying to make Time Zero all things for all people (the iPad may simply be the wrong tool for that), but choose to do a few things very well for a very specifically defined audience. In that way it feels very Apple-like. Valuable comments, George and Collin; thanks! Mark, Sorry to read that you can’t see the Canadian charts you bought, and hope that the problem gets straightened out. But I sure don’t see any analog regarding U.S. charts. I’ve now downloaded nearly a gig of them for spots all over the country without any problems (using iPad mini running IOS 6.1.3). I can also zoom in anywhere and TZ auto downloads charts as needed. It’s not that easy to find particular spots, though, as the large area charts lack detail and TZ lacks a geographic search function. I also notice that there are no hi-res PhotoFusion maps for Lake Champlain and the Hudson River but they do seem to exist for the U.S. shores of the Great Lakes. I hardly see any PhotoFusion maps for Canada but maybe the app knows that I don’t own the charts there. I think that anyone cruising along the U.S./Canada border has a hard time figuring out exactly what’s included in electronic chart coverage. Many are just like TZ, which ‘just’ has the complete NOAA (raster) chart portfolio of the U.S., with its minor Canadian overlap, if you just buy the U.S. region. The C-Map Plan2Nav USA East Coast & Bahamas region ($30) I have is pretty generous with at least Lake Champlain and nearby Canadian coverage, but you probably need their Great Lakes or Canada coverage if you’re doing many miles up there. The best chart deals may be total North American coverage like Garmin offers for $45 and Navionics for $55. Incidentally, Navionics Marine&Lakes USA HD does have high resolution depth contours for Lake Champlain (and many other lakes). So again Karl was making critical remarks based on misinformation or wrong assumptions. That’s not useful for anyone, Karl! I’m updating my earlier post about the application not working. A knowledgeable support engineer called me later in the day and, after some troubleshooting, had me delete the app from my iPad and re-install it from the App Store. After the installation, I restored my map purchase and was able to view the detailed charts in the map download panel. I downloaded several cells and verified that they worked correctly. The app is now working as advertised. I still think the cost of the maps is pricey, since the US raster charts are free from NOAA. I don’t see the quantum leap in functionality that other see. I’ve used other iPad apps quite a bit and find them all a bit clunky. Good to hear it’s running, Mark, but I thought you bought Canadian charts? If so, it would be good to hear how they look and if you also get access to hi-res PhotoFusion maps like you can see in my screens above for U.S. coverage. If you don’t mind, please also look on the Canadian coasts. Incidentally, Canada gets a royalty from any company reproducing its chart data, like most countries in the World. I think that’s why the U.S. version of Nobeltec TZ is $10 cheaper than most other regions. Not to hijack (but I guess I sort of am)… why is it that software developers are still primarily releasing software for the iPad only? I understand that the cost of developing for two different platforms is big (Objective-C vs. Java), but the percentage of Android tablets out there was supposed to exceed the number of iPads out there right around this month. AND the expectation is that Android tablets on the market will exceed by a significant number iPads by the end of the year. I just bought a NMEA0183 to Ethernet adapter to use with my Android tablet and have been looking for high quality charting software – and, more importantly to me, high quality instrumentation software (wind, depth, speed, etc.) – and haven’t really found anywhere near as many as are available for the iPad. It’s not even close. There are a number of decent apps for charting, but even these lag behind their Apple counterparts. Ben – have you seen many good Android apps out there? I’d love to see TimeZero on the Playstore. Hi, Chris. I gave my wife a Galaxy Nexus last year but retained “testing rights” 😉 It’s nice that Android supports multiple users so well, but I didn’t have the tablet aboard during my long cruise south and back. So I haven’t used the Android charting apps much recently but Navionics looks good, I think that the new Android Plan2Nav is good, and I know that EarthNC has gained some neat new features like variable transparency of multiple chart layers. I’m surprised to hear that Android tablets now outnumber iPads, and very much doubt that’s true among the boaters who might buy these apps. I rarely see Android tablets on boats I visit and Raymarine, which nicely gives away apps to customers who buy their current MFDs, told me that the number of Adroid downloads is much lower than IOS. Try to find a good app that displays instrumentation though. 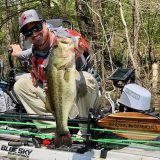 I want to read my depth when I’m on the bow of my boat and the options are VERY limited. No pretty apps at all. Charting – there are definitely more options. The reason why there are more android tablets out there now is that there are a ton of manufacturers and you can get some decent options in the sub $200 range. 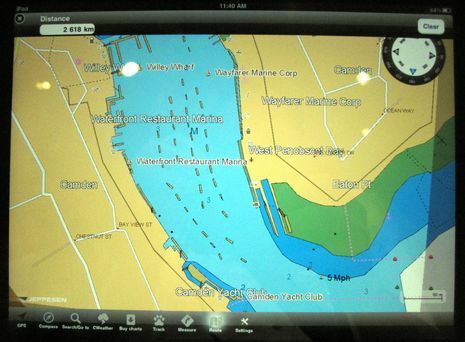 I would concur with Raymarine though – I see far more iPads around our marina than Android tablets. I’ve downloaded about 10 or 12 charting apps I plan on evaluating over the next few weeks. I wish we were out cruising again, but a trip down the Hudson to Sandy Hook and back will have to do. And speaking of mobile devices… Any plans to upgrade your website to a responsive design anytime soon? Chris, please consider pitching me a Panbo guest entry on your Android chart app testing. Fame and fortune will follow. Ben at panbo.com. Finally, how would you like to see Panbo redesigned? I know it looked awful on older phones but I think it works fairly well on current smartphone and tablet browsers. I think one of the problems is that the market for Android tablets is so fragmented. Just have a look at the cell phone market. It is very difficult for developers to develop an app that works on hundreds of different devices, with totally different screen sizes, resolutions and cpu/gpu power. It is just so much easier to develop for the apple eco-system. There are only two resolutions to develop for and only two- or three different hardware configs. I see you posted the it worked with your bad elf pro mine shows no data but I sailor and garmin and navionics all work fine does Nobeltec TZ work with the bad elf pro? MaxSea are about to release their version for the rest of the world. 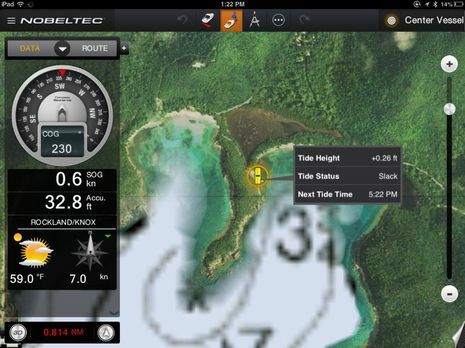 Nobeltec app targeted for USA, MaxSea for the rest of the world…still no mention of vector maps though. Mike, TZ and Bad Elf Pro work great together, as noted and illustrated at the beginning of the entry. In regards to the question of Satellite overlay on Canadian Charts? For the West Coast I can definitely say “no they do not” The charts as we know are (CHS)Raster mm3d format very good charts but no pretty satellite overlay option like in American waters. I am not sure why exactly that is , I Think the bigger question is why Hd satellite charts are an issue in Canadian waters? They do exist in google and other mfd/formats…As well I am Nobeltec trident user with ver 1 or ver 2 mm3d charts and the satellite overlay charts exist but are not something to be desired as they are of very poor quality by today’s standards. Hence my guess the reasoning behind not putting them on the app as they would be…to be politically correct, not a good fit. It’s quite water resistant, as in submersible, though not especially bright and I don’t think the WiFi versions include GPS though a Bluetooth GPS should work. I was going the right way! 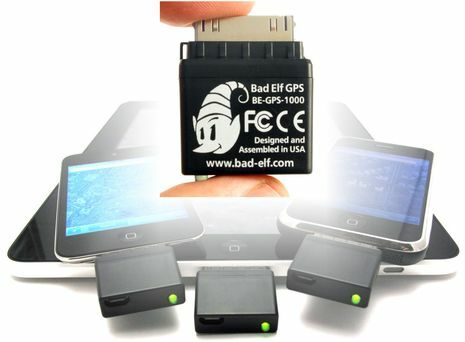 I love how that screen shows how accurate both the PhotoFusion maps and Bad Elf Pro GPS can be. And, mind you, the Bad Elf was in a backpack on my rear seat while I drove downtown and then backed into a parking space on the Public Landing (hence the jog in the track). The walk down the dock and the row out to Gizmo are also described very accurately. Still can’t see the value of 3D. It’s all about situational awareness. Yes? As a pilot and a sailor for 30 years, it is totally ‘seeing’ your situation and staying ahead of the ‘speed’ to make plan decisions before you need to make them… It is in my minds-eye that the 2D forms the best information and 3D does not. Yes, there’s been a ton of arguments ‘for’ 3D, but after running TZT for some time now –forced upgrade as our computer hard disk crashed in Panama and Nobeltec would not reissue me a license for my 9.x on a new hard disk–, I am always turning off that !#[email protected] 3D and going 2D [commando mode]; 3D is a confusion of too much needless information. In fact, I believe you become ‘situationally impaired’ when using 3D. It is pure clutter and useless junk info, but quite beautiful, indeed. Crash! Mike, no problem. The “not connected” does go away after a while. Rob, I think that 3D can be great for situational awareness when underway, especially if you are using a route and especially if TimeZero is doing the 3D. But I know I’m in the minority at this point. Watch what grand kids choose for effective navigation, though. Thanks Ben for the 3D comment. To me it’s like reading a book (sorry –e-Pad) and forming the story’s picture in your mind’s eye, versus simply watching TV and letting the story get played out to you, spoon fed. Not saying I don’t like a good movie, but when reading a good book, I will do the work to image the movie –and hopefully stay ahead of the plot. I have numerous ‘brands’ of ‘planning’ software on board due to simply using planning software since the early ones in the late 1980’s. Of all the ones on board the TZT 3D mode doesn’t cut-it, but the Garmin Home Port does, when it comes to one thing and one thing only: planned course depth. I gather one value of the 3D view is to see depth info graphically in TZT as you do a flyover of a planned course. On the trip from Panama along the banks in the southwestern Caribbean, I had ran the planned course in Home Port and TZT. Then I compared the situational awareness –apparent– that both provided. 3D failed and good old 2D x 2 won. Like flying an NDB approach, where you get two 2D depictions instead of a single 3D image, you can see in one the top down view and in the other 2D pic the altitude or side view. With the Home Port if you select the route you can display a graph showing a depth contour –a second 2D depiction beyond just the top-down view of the chart. This is the one and only useful feature in Home Port that is not present (apparently) in the other planning software I have seen so far. But it is a good compare of good old 2D (2x in this case –where none of the other planners I have seen have that second 2D depiction –depth) that wins hands down over 3D. And since TZT is “3D,” I am pretty sure ‘they’ will feel there’s no reason to add a feature like what Home Port has to graphically depict depth along a route, because it is already ‘there’ in the 3D; just good lock trying to find it without using your boat as a sounding weight. I completely agree with Rob. We almost never use 3D mode on our Navnet3D. There are two basic problems that make it unusable, one of implementation and one that’s perhaps unavoidable when working in 3D. As a practical matter this means that the soundings most relevant to your situational awareness — the shallow ones ahead of you that you can maneuver to avoid — are difficult or impossible to read. The seafloor deformation and depth shading are designed to address this, but are insufficient. In areas of limited seafloor variability the deformation doesn’t offer additional information, and the depth shading is relative so you are never sure what color codes for what depth of water. I’ve also found that the depth shading is inconsistent along shallowly shoaling shorelines (sorry). The second issue is parallax. When you are looking at a scene in 3D, depth assessments are very difficult because your angle of view (and the bottom contour) changes the apparent location of soundings in relation to the seabed. You can project a normal from the boat icon to the bottom in order to get a sense of the parallax effect, but that only applies to the boat. This problem isn’t inherent to MaxSea’s renderer but to all 3D projections. I can think of a few visual indicators that might help address the issue, such as “depth poles” or increased contour frequency, but at the risk of significantly increasing clutter. In sum, we consider 3D “pretty pictures” that in real life use weakens, rather than enhances, situational awareness. Gentleman, there’s a reason that “Power of Simple” Garmin locks its 3D screens in Head Up, Look Ahead modes, like that last TZ screen above. The idea is to put your onscreen vessel in a context that closely mimics what you see out the pilot house windows (or up in a high crow’s nest), except with emphasize on dangers or points of interest you can’t see well or yet. Of course depth soundings far up ahead are small in 3D but if you were in 2D at the same zoom level around your boat, that area up ahead wouldn’t be on screen at all. 2D North Up is by far the better mode for planning voyages. It also happened to fit quite well with the limitations of having charts on printed sheets of paper. Some people still like to do underway charting in 2D North Up. Some insist that that is ONLY way it should be. Personally I rarely use 2D North Up when underway anymore, but I certainly wouldn’t tell someone who does that the mode is useless. Why 2 versions? I downloaded the TZ app in both Nobeltec and MaxSea flavors and all I see is cosmetic differences. “The App itself is the same thing. However, technical support for the MaxSea App is only offered in French. That sounds like Nobeltec saying this, not MaxSea. If MaxSea support only spoke French they wouldn’t sell much outside France. Not very believable, this. I’d say that MaxSea has better brand recognition in some parts of the world and Nobeltec in the USA. Kees, that quote is direct from the marketing folks at MaxSea International, though perhaps they meant technical support from France, not necessarily in French. 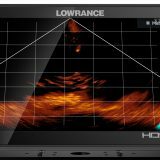 I am just wondering what is the difference between TZ by nobeltec and TZ by Max Sea? Which of two willyou recommended or it is the same app? Same app, Eureka, but Nobeltec TZ has technical support in the U.S. while MaxSea TZ support is in Europe. I doubt that many users will need tech support, though. Routes and Marks can now be imported/exported by using the iTunes file exchange feature under .TZD format. This allows the user to exchange data between ALL TimeZero systems (NavNet TZTouch system, MaxSea TimeZero/Nobeltec TimeZero software and Apps). •	There are two import functions: Add or Replace Data. •	When importing a .TZD file, if it exceeds the iPad capacity, a warning will indicate the amount of data that can be imported. •	Reminder: A maximum of 1,000 marks and 50 routes (maximum 200 points each) can be imported. 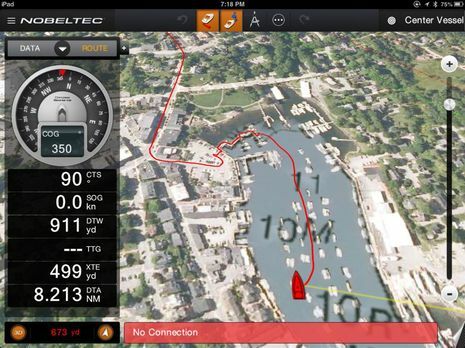 Pictures and screenshots can be taken from the App and geo-referenced on the chart according to the boat’s position (or in the center of the screen if the GPS is not in use/not available). They are recorded in a specific layer that can be displayed/hidden from the tab corner and in the iPad photo albums under the name “TimeZero” as well. •	Images can be moved in the same way as a Mark in the App and then shared on Facebook. •	Tap “Function” to minimize/maximize the images. •	They can only be deleted by doing so from within the iPad photo album. •	Previous high or low tide. •	The next complete tide (one low and one high tide). The closest tide height and tidal current stations to the boat are permanently displayed if and only if a corresponding station is available within 50 NM for tide height and 5 NM for tidal currents. This tide mini-graph has also been added to the Waypoint and Active Route context menus (if a station is available within 50 NM). Tide height, Current speed & direction, and Next time tide (low or high) have been added to the default configuration of the NavData menu. Four types of event can be configured from the Boat icon and the More “(…)” menu to mark the current position of the boat with specific icons. •	Cancellation by default of automatic sleep mode activation of the iPad during the chart download process to avoid any interruption. The user can always manually reset the automatic sleep mode on his iPad. •	The chart download process will be cancelled when the iPad goes into sleep mode (if reset manually by the user) and the progress circle stops appearing. •	White screen without any data. Anyone figured out a way to convert and import .gpx data? Can’t imagine having to manually enter 100’s of waypoints? There is a bug in the PC version. If you export to .gpx I cannot import the .gpx file to Garmin. I have to export to .gpx from TZ then import that file to Open CPN and then export again. Also TZ exports the entire database of routes, even if you only want one, but from Open CPN, after loading the TZ export I can then pick and choose which individual route I’d like to make a .gpx file out of for loading into Garmin. This also happens when trying to use Garmin Home Port or directly to the Garmin unit. So if you share routes between the App and PC you may have issues sharing the routes with Garmin. Ok… Read through all the comments.. All about chart loading and some snipping back and forth etc.. However nothing that I saw about entering a waypoint? Other than scrolling to a position on your chart, is there a way to manually, (gasp) enter the lat and long? Of, say, a drop mark position, say a small sailboat is planning to do the PBR this weekend in Camden and Rockland, and say the RC boat loaded with PRO’s has this habit of squawking out the lat and long of the drop mark/ first turning mark inside or just before the 5 minute sequence as is their practice, is there a way to enter this lat and long of a waypoint? I have read through the online PDF manual, no reference either. Am I going to have to use iNavx this weekend instead? Sorry, Jesse! I find that I can see a waypoint’s lat/long by selecting it but there should an edit button on that dialog box for boaters like you (head’s up Nobeltec/MaxSea please). They emphasized visual route building in TZ, which generally suits me fine, but I know that fishermen want to enter numerical waypoint positions just like racers do. I bet you do well in the PBR anyway. @Jesse. I feel your pain. 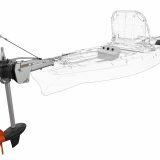 Sail racing is a small sliver of the marine electronics market, thus not usually well served. I’ve attempted to enter a couple sets of racing instructions into a few of the tablet based route planning apps … Highly frustrating if even possible. @ vendors. Less eye candy please and more focus on real usage. 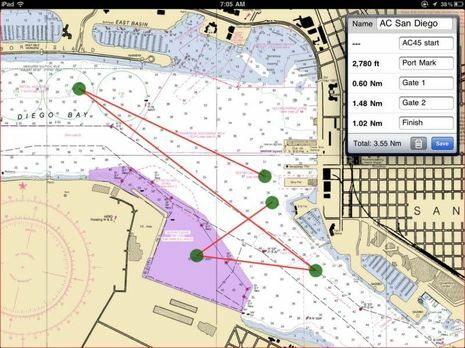 I can provide several sets of racing instruction examples which highlight our issues … multiple routes, often variations using a small number of government mark waypoints, to be QUICKLY entered into your apps AND exported to an on board nav unit. AFAIK no vendor is yet doing a decent job (practically usable solution) with this use case. Any idea if the track function can be adjusted or saved. The product is useless to me because I can’t figure out how to save a track and then display it or start a new one. Help me please? Dan, you turn track recording on and off with the boat&track icon on the top NavBar (near left end). It’s enabled in the top two screenshots above. Display of tracks is controlled under the Layer Tab (tap bottom right corner). In the set up menu (under upper left “Nobeltec”) you can adjust track point frequency, track color and width. You can export track and other data using iTunes. This is a fantastic publish regarding android operating system development! Those who want to understand such will absolutely find these training useful and beneficial. I am of Irish descent and have that condition. No surgery yet but maybe in a few years. I don’t know if this thread is still active, but will gi it a shot. I just installed the TZ app and bought the charts for the NW region. In spiteof repeated tries, I am unable to get the “Camera Integration” to work. The “Camera” button is ALWAYS greyed out. I am using an iPad mini with IOS 8. And a Bad Elf Pro with the latest upgrade. I’m able to access the camera in TZ on my iPad mini with iOS 8. In the iPad settings icon, under the TZ section (apps, TZ icon), check to see if both photo and camera is set to allow (on), under the privacy settings tab, at the iOS level, for the TZ app. If this not enabled in privacy setting (iOS) under the TZ app, then camera may not be accessible from within the TZ app. Try the latest free i-Boating app. Its like Apple maps for marine navigation. Navionics with just NOAA vectors has limitations, of course; they really want users to buy their own chart subscription. But completely free charting is a pretty rare bird.